The Lesser Adjutants (Leptoptilos javanicus) - also known as Lesser Adjutant Storks or Hair-crested Adjutants - are large wading birds that occur naturally in South and South-east Asia. These birds are generally solitary - except when breeding at which time they will form loose nesting colonies. 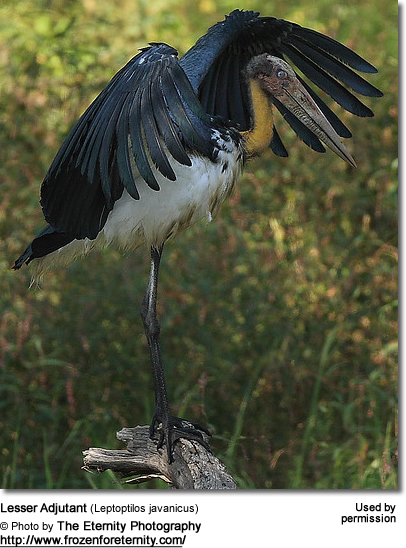 They are members of the stork family and related to the Greater Adjutants. They were named "Adjutant" by British Colonial troops based on their slow and stiff "military" gait and their habit of standing motionless for long periods of time reminiscent of officers (or "Adjutants") standing at attention. Lesser Adjutants are mostly sedentary within their range, except for local movements in response to rain falls and availability of food. Bangladesh, Myanmar, Laos, Malaysia, Brunei, Vietnam and Thailand. May occur as a vagrant in Bhutan. They are generally found along large rivers, lakes, swamps, as well as in fresh and saltwater wetland and wooded areas. Coastal populations occur in mangroves and intertidal flats. Previously quite common, their numbers are declining due to destruction of their habitats and harvesting of their eggs and chicks. These storks are now quite rare throughout their range. 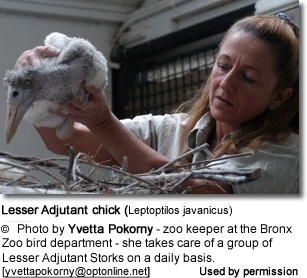 "[I] have the privilege to take care of a group of Lesser Adjutant Storks on a daily basis. Among daily routine feeding and cleaning we study their behavior and collect data trying to get as much information and knowledge as possible ... Sadly this species of Storks are on the decline - there are only a few thousand birds in the world left mostly in South East Asia. We realized that only a program aimed to protect their nesting sites and habitats can save them from extinction. 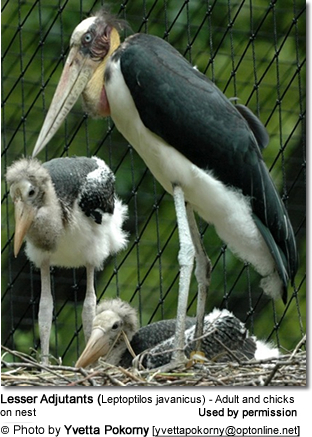 Lesser Adjutants do not breed in captivity on a regular basis, and we are the only place where a generation of LA Storks has been successfully born and raised in captivity. By collecting data and observations we are able to pass the knowledge onto rangers in the field and support our conservation program in South East Asia launched by Wildlife Conservation Society." Please visit her Adjutant webpage for more information. Lesser Adjutants stand about 43 - 51 inches (110-129 cm) tall, have a wingspan of about 83 inches (210 cm) and weigh about 19.6 lbs (8.9 kg). Their large outstretched wings are perfectly adapted for soaring on thermals. They have pale, long and thick bills. The upper body and wings are glossy dark grey-black and the underside (chest, abdomen and undertail feathers) are white. The neck and head are mostly featherless(except for a few scattered hair-like feathers) and mostly yellowish in color with a wine-red tinge to the sides of the head and pale forehead. Breeding birds have reddish faces and orange necks, as well as coppery spots on the middle wing feathers (median coverts), with narrow whitish edges to the lower "shoulder feathers" (scapulars), and wings. Their dark grey legs are often stained white with uric acid as they commonly defecate on them. This is believed to be a cooling measure, as the evaporation lowers their body temperature offering relief when temperatures are uncomfortably high. Gender ID: Males and females look alike; except males tend to be larger in size and heavier billed. Juveniles resemble the adults; except they are duller versions with a less glossy upper body and wings. They also have more feathers around the neck. In flight, Adjutants can be distinguished from other storks by the fact that they retract their necks in flight - like herons, for example, while most other stork species fly with their necks outstretched. The Lesser Adjutant could only be confused with the Greater Adjutant. 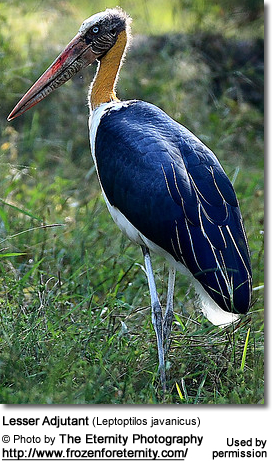 However, the Lesser Adjutant is smaller in size and lacks the pendulous neck pouch seen in the Greater Adjutant. This being said, in flight the Lesser Adjutant's folded (retracted) neck can appear like a pouch, possibly resulting in confusion with the Greater Adjutant. The latter also has more massive bill with a straight upper bill edge (culmen), paler head sides, and pale grey greater wing feathers. Lesser Adjutants are believed to be monogamous - however, they may not always pair for life. Typically solitary birds, they only form groups during the breeding season. Lesser Adjutants breed during the dry season, which varies geographically. 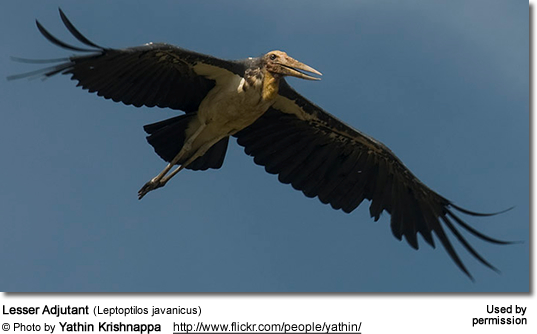 In southern India, they breed from February to May and in northeastern India from November to January. 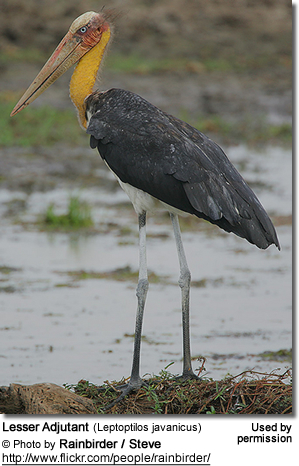 At the onset of the breeding season, Lesser Adjutants congregate at nesting areas in suitable wetlands. They often form small, loose colonies - sometimes including other large waterbirds, such as Pelicans - and several of them will build their nest in the canopy of one single, tall, broad-limbed trees with sparse foliage. Prior to nest building, they will occupy favored trees and males will claim suitable nesting branches, chasing away competitors. At this time, they are commonly seen perching on the branch pointing their bill upwards while clattering them; arching their bodies or holding their wings half open and drooped. Males will present twigs to their mates as part of the courtship ritual. Pairs will also perform up-down bobbing motions together. The large platform nest is constructed by both parents out of twigs with an outer layer of bamboo stems, and the shallow top indentation is lined with grasses and leaves. The nest is placed at the end of a near-horizontal branch. Historically, they have been recorded to nest on cliffs. Their nests are, on average, about 3.3 feet (1 meter) in diameter and up to 3.3 feet (1 meter) deep. The female will lay 1 - 4 (mostly 3) white eggs at intervals of 1 - 3 days. Both parents share the incubation of the eggs for about 28 - 30 days to hatching. The hatchlings are covered with thin grey down and they are brooded for about 12 - 14 days; after the first week, the amount of time spent brooding them decreases gradually. Both parents feed and care for the chicks. During hot weather, they are observed spreading out their wings to shade the chicks. They will also bring water to the nestlings - either for drinking or to cool them down. The young fledge when they are about 47 - 52 days old and are independent when they are about 5 months old. They breed once a year, although clutches may be replaced if the first one was destroyed. Lesser Adjutants are often observed stalking around wetlands as they search for prey, such as fish, frogs, reptiles, locust and large invertebrates. Young birds, rodents and carrion (dead animals) are also eaten. The bald head and neck of these scavengers become rapidly covered with blood and other substances as they feed inside corpses. As distasteful as this may appear to most, these valuable scavengers of carrion are believed to play an important role in preventing the spread of disease. Lesser Adjutants are mostly silent as they lack vocal muscles; however, they have been observed clattering their bills (males, in particular, as they advertise and protect their territories), and also making hissing and moaning sounds.